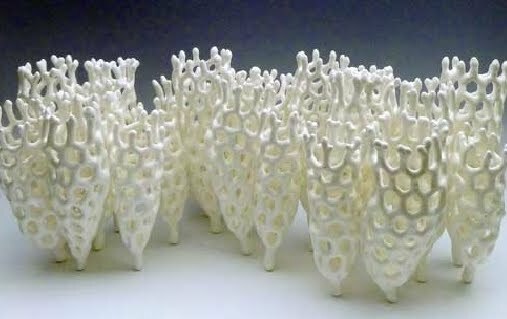 Anthony Foo is pleased to present his new ceramic sculpture, COLONY, at this year’s City of Brea 26th Annual Made in California Juried Exhibition. This exhibition runs from March 26th thru May 6th, 2011 at the City of Brea Art Gallery, Brea Civic & Cultural Center, 1 Civic Center, Brea, CA 92821. Phone: (714) 671-3601. Opening reception is on Saturday, March 26th from 7:00PM to 9:00PM. Admission is FREE. Anthony Foo is an Orange County ceramic artist who has exhibited at the American Museum of Ceramic Art (AMOCA), Kellogg Art Gallery – Cal Poly Pomona, California State University Fullerton (CSUF) Grand Central Art Center, The McGroarty Art Center in Tujunga, City of Brea Art Gallery, Irvine Fine Arts Center and online Upstream People Gallery. He and his work have been written up in "Orange County Weekly," "Art to Art Palette" and "500 Raku" by Lark Crafts. “COLONY is the newest in my paper clay and wire mesh sculptures,” says Foo. To arrange an interview with the artist, please call (714) 528-9304, or send an email to info@anthonyfoo.com, or visit the website at www.anthonyfoo.com. This piece started out with 21 individual wire mesh pods that I made from a roll of chicken wire (steel mesh hardware cloth) that can be found in any home building supply store. Each one was dipped in Southern Ice porcelain paper clay slip until the desired thickness was achieved. It took me about 2 weeks to get the thickness I liked. The initial process was slow as I had to wait till the slip was completely dry before the next dip was made. As the layers build up, I was able to dip about 4-6 times a day depending on the weather conditions. The final stage of this piece was assembling the individual pods into three groupings. This allows the sculpture to be arranged into different formations, each one giving a different feel to the composition. As the steel wire is embedded in the clay, the work was fired to Cone 06 (bisque). No glazes were used. A clear coat was sprayed on the piece to seal the surface.